Teacher tells Johnny "Your composition on "My Dog" is the same as your brother's. Did you copy his?" TEACHER : "Can anybody give an example of " COINCIDENCE?" Little Johnny : "Sir, my Mother and Father got married on the same day." Little Johnny : "K-R-O-K-O-D- A-I-L"
Little Johnny : Maybe it's wrong, but you asked me how I spell it! TEACHER : Little Johnny, go to the map and find North America. Little Johnny : Here it is! Teacher: Johnny, if your father earned $100,000 and gave half of it to your mother, what would she have? Isn't that Lucy and Wendy from school? Let me show you how to impress girls! No! Eddie, that's too high! That swimming suit looks just like mine. Don't worry! 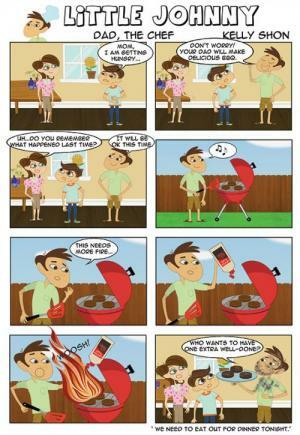 Yor dad will make delicious BBQ. Um...oo you remember what happened last time? Who wants to have one extra well-done? She called on him and said, "Johnny! what are 4, 2, 28 and 44?" A priest was talking to a group of kids about "being good" and going to heaven. At the end of his talk, he asked, "Where do you want to go?" "Heaven! Heaven!" Yelled Little Lisa..
"And what do you have to be to get there?" asked the priest.